Lambers Tax Preparation Basics – Lambers, Inc. Looking to become a full or part time tax preparer? Are you a newer tax preparer looking to increase your knowledge? 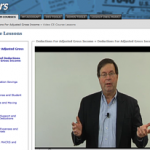 The Lambers Tax Preparation Basics course is the perfect place to start. This online video course consists of over 7 hours of instruction, a tax guide with easy-to-read chapters, many of the forms and publications you need to be familiar with and even some fun learning games! 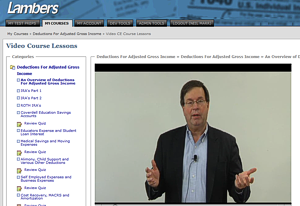 Your instructor for this course is Professor Arthur Reed, MBA, CPA, MST. Professor Reed will even show you how to fill out some of the tax forms needed in everyday tax preparation. Filing Status, Standard Deductions, Additional Standard Deductions, Exemptions, Filing Requirements and Statute of Limitations.